Took these photos a few weeks ago wearing the most comfortable maxi dress by BCBGeberation. I love the drop waist with subtle pleating because it creates a fit and flare silhouette that’s very flattering for all shapes and sizes. I’m also kind of obsessed with the peak-a-boo open back details. What a perfect look for summer! Your dress looks really nice! Lovely necklace! KT can you share your lipstick info? I think this is the color you always wear and I love it but never see any info on it. Please let me know, I’d love to purchase it. It looks so nice on you! Ok, it’s official, I am dying my hair black! You inspired me so much. I love the dark hair color on you. Such a stunner! Stunning!! Love all of your outfits! One of my favorite looks! I love how tall you look in this dress also! I love me a good easy breezy maxi too! It’s so easy to style and one of those slip on and go outfits. 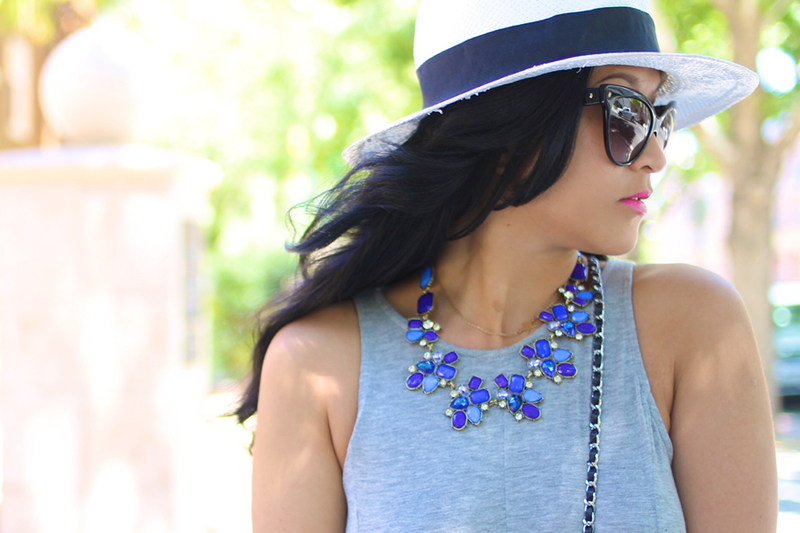 I love how you paired it with the hat and bright blue necklace! Perfection per usual! A solid color maxi is what is missing in my closet. So much potential, and such a flattering silhouette!